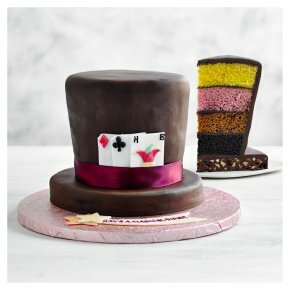 Consists of sherbet lemon sponge, raspberry jam swirled sponge, chocolate sponge with blackcurrant flavouring and a salted caramel sponge with fudge and honeycomb pieces. Each layer and sides are en-robed in a sweet dark chocolate glaze. Sponges sit on a chocolate and almond tiffin base. A chocolate fudge icing covers the whole cake and base. It is finished with hand made and hand applied sugar paste decorations. INGREDIENTS: Sugar, water, wheat flour fortified (wheat flour, calcium carbonate, iron, niacin, thiamin), Dark Chocolate (10%) (chocolate, cocoa mass, sugar, cocoa butter), rapeseed oil, wheat glucose syrup, humectant (vegetable glycerine), milk chocolate (3%) (cocoa mass, sugar, cocoa butter, soya lecithin, vanilla flavouring), butter (milk), free range whole dried egg, free range whole egg, salt, palm oil, emulsifiers (mono- and diglycerides of fatty acids, soya lecithin, lactic acid esters of mono- and diglycerides of fatty acids, polyglycerol esters of fatty acids, sodium stearoyl-2-lactylate), milk whey powder, fudge pieces (sugar, sweetened condensed milk, wheat glucose syrup, palm oil, butter oil (milk), vanilla flavouring), fat reduced cocoa powder, raspberry jam (sugar, raspberries, gelling agent (pectin), acidity regulator (sodium citrates)), cocoa mass, raising agents (sodium bicarbonate, diphosphates, sodium carbonates, ammonium carbonate), fruit and vegetable concentrates (apple, blackcurrant, radish, carrot, pumpkin), stabilisers (tragacanth, xanthan gum), preservative (potassium sorbate), vanilla flavouring, almonds, maize starch, invert sugar syrup, sour cherries, raspberry flavouring, sunflower oil, caramel syrup, wheat glucose-fructose syrup, lemon oil, barley malt extract, colours (vegetable carbon, beetroot red, curcumin), dried free range egg albumen, citric acid, spirulina, safflower, butterscotch flavouring, blackcurrant flavouring. Allergy Advice For allergens, including cereals containing gluten, see ingredients in bold May also contain other nuts.